Thought I'd made a bad decision getting out at 330 when it was 20kn plus heaps of boat traffic making the river as rough as guts. Was much nicer around 5-530 with 15-18kn and hardly any boats. Glad i hung around as it was worth it. Fangy's Pinna trap worked like a charm today, snared the Boz Beetle in the thick week which must have been strategically placed for maximum impact. Well impact it was weedburg 1 Delta XT 18 Zero KA mast retired due to being now a three piece mast. Water levels low today but was fun even though quite draggy through the weed. Tim and myself having a fun time and I even warned him about the more clumpier bergs just before I decided to chase a gust through the weed. So if your wondering if a delta is a safe bet well not really, for 80% yes but the thicker bergs not a chance. Thankfully only gear failure and a couple of nips by the friendly blue mana's while walking through the weed to get back to the shore, thanks Tim for helping derigg the gear, nice to catch up with Fangy and Jonski even a quick chat with pacey from the pinnas. Wind was light when I got on the water about 15-18 knots then started to pick up 30 minutes in. by this time the big board started to feel horrible and draggy but kept going to complete an hour. Came in and changed to the small board which felt so much better. Went for a few runs in the shallows and was tempted to follow Jase who was way up wind in the shallows. Lucky I didnt as I didnt know he had a delta fin on! A relatively constant wind for melville standards. Pleasant warm weather and nice to catch up with a few of the regulars. 6.2 reflex, futura 91 and tribal 31 ws then mistral 91 & 25 tribal ws. Where has all the water gone? I was out on my big board with a 36 fin but that was touching the bottom so I switched to a 20 Delta and went and had some fun with Jase in the ankle deep stuff. Huey again failed to turn up and also took the water with it. An interesting session on the hyper smooth carpet, with the occasional larger weedberg hidden within, as Boz would find out. Good to see Boz pick himself up after a big catapult and only break some gear this time. SB i87, Evo5 6.4m, Delta19. Safety Bay, WA, AU. Went for an hour sess to try to get the body back in shape a bit. Wind died off about half way through, otherwise could have been a cracker! Oh well, plenty more days to come. Wow Boz, Snot city there, shame about the mast but way better than bone breaking. great speed for the foil, Lunny! Please tell me Hooksey hooked into an hour today, else my jelly legs may be in vain!!!?? Snake, are you going to post your numbers, or just keep us in suspense? You didn't do an hour yesterday, per chance? Ignore everything your read about Deltas and weed burgs down here from Boz. If you put them in with the vertical bit of the fin at the back instead of the front, they go through the weed fine. Fangy so that's what I did wrong. 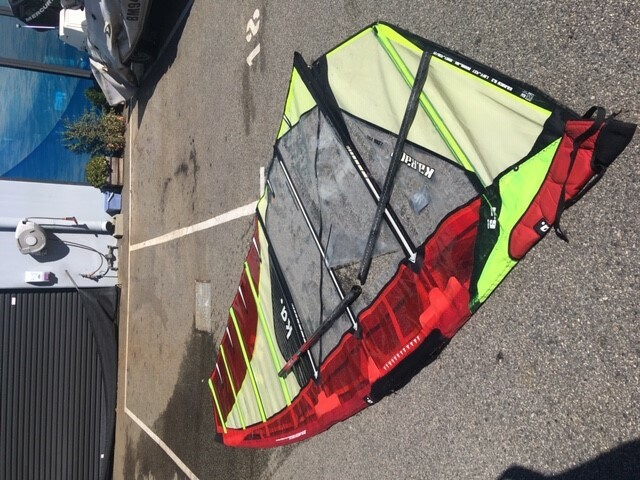 The carnage of yesterday, 1 mast 1 favourite 2018 6.3 KA sail. Fangy I'm sure you need a 6.3 in your quiver, going cheap 12 months old handled with care low k's. Jake - I know what out of shape feels like. I am still recovering from Thursday. A couple of unplanned dismounts did not help. Glad you're OK Boz Beetle. Save yourself for the upcoming races. By the way your sails (and boards) are lucky to last you a single season!You should seek sponsorship so that you can update half yearly! Fangy for once good advice the two layers of duct tape has worked, RDM cams changed over to SDM as I have one SDM mast that I've pulled from the cobwebs in the corner of the shed, the old faithfull (well new considering it's a 2018 sail) is back up and running For how long that's to be seen will give it a test today. Boz, are the new season's 6.3s still on the boat or something?